I love this Activity Center. It keeps my daughter entertained so that I can get my house cleaning and cooking done. I really like that it grows with my child and she will be able to use it til she's around 2. I would definately recommend this to other moms I know. My son loves his exersaucer! He would stay in it all day(if I let him). It has colorful toys that are great for fine motor skills! My six month old entertains herself with all the toys, especially the ones whose tethers are long enough for her to chew on them. She also loves to rock back and forth, sometimes wild enough to cause a racket and the thing never seems unstable or unsafe. My major complaint is the bouncer aspect, which just doesn't work. She's nearly 20lbs and still can't compress the stiff springs. I wish softer springs were available. Poor suspension and attachments hard to use. This toy is hardly a "jumper". The bottom suspension system makes it very difficult for the child to actually bounce. It hardly even moves up and down. I wish I had bought a jumper that has the traditional four springs hanging from above that actually allows the baby to better use his weight as he bounces. My baby is a strong 4.5 month old boy who is obsessed with jumping everywhere else but his jumper toy. As you may notice, the picture shows a really tall boy who can probably already walk. The buttons on all the features are so hard to push down for a young infant; because they are so rigid. He cant even reach some of the features like the helicopter or the tree. He is 23.5 inches long. Though the toys would be pretty cool- if they were actually accessible and easy to use. Overall the bouncer is nice but the learning pad portion is almost unusable for a baby. As an adult I have to push super hard on the "buttons" to get the pad to change screens and talk. For a child it is impossible to use this feature as intended. I bought this for our 4 month old and after assembling realized the arch doesn't work! Had to look up to see what it even does. Also, the "interactive" screen is very hard to press down for an adult let alone expecting our baby to do it. Very disappointed. Should've researched more prior to buying! The main reason I purchased this exersaucer verse a different exersaucer is because of the screen included on this one. Within the 1st week after putting this together, the screen is off track so the picture shown is different than what is being said. What a waste of money! All the other toys are nice, but nothing special. I already had to return the 1st one I purchased because not all the screws were included in the sealed package. I should have listened to the other reviewers that had the same issue as I did. This exersaucer is priced way too high to have the main toy on the product not work. We received this for our daughter as a Christmas gift, we were very excited to receive it. I had researched exersaucers and we thought this one would be perfect for us. Sadly, we are less than thrilled with this piece of plastic. The little screen that has animals scroll across it doesn't line up correctly, it will be a picture of an elephant and say koala. The orange and yellow striped arch never stays in place, we snap it in and literally less than 20 seconds later one side has popped out. It also takes a lot of batteries to run all the light up things. One thing I do like is the removable seat and you can easily remove it to wash it. We just bought this product for our three month old son. The padded mat is nice for tummy time. However the arch with the hot air balloon does not work after two different brands of new batteries so the play mat option is a waste. Obviously he is not old enough to use the seated portion but so far my experience with this product has been quite poor. When this arrived I was super excited and hoped it would make me the cool aunt and it sure did! My sister brought over her son (8 months old) , and as soon as we put him in it he was bouncing and playing with the toys and smiling like crazy. My sister told me that it is her go to now for when he is grumpy because he loves it and can spend hours in it playing. Her other one he was able to tilt over when he would bounce hard and now with this one she doesn't have to worry about him tilting it and looking like he is going to flip it over! Looks like baby would really enjoy it for a long time. My mom commented on how far these have come along-and how much easier it is to clean. We missed the play mat stage, but taking full advantage of the bouncing stage. It is designed to help your baby achieve important developmental milestones. Unique developmental toys include a story book pod, featuring 12 pages, 36 different sounds and 4 languages. In a few short weeks I am sure we will be setting it up as the table, since little miss has begun taking steps! Something we are both excited for and scared. It is fun to know I can set her in there and she will entertain herself. Being a bi-lingual family, I love that this toy speaks a few languages and the World Traveler theme is one that fits our family perfectly. What is there not to love about this amazing product, first of all I have to say that for me being able to have my little one explore her world in a Exersaucer is just amazing. Trying to raise my children in a bilingual home, I try to find products that will help me in my little ones learning, it is such an amazing feature to be able to offer my child exposure not only to English but also Spanish, not to mention French and Mandarin. I also love the fact that I'm able to make a one time investment and basically get 3 products in one, for the learning and entertainment of my little one. Tons of fun in just one piece of equipment! This piece of equipment is an amazing value, considering your child will grow with it from birth to at least 2 years old. My 21 month old son LOVES it! We have it set up to the 3rd stage, as an activity table. The interactive toys really keep his attention and I like that it exposes him to 4 different languages! You will need to have plenty of batteries on hand to make sure most of the toys will work. This makes a great shower gift and something that the family can easily store and convert as needed. I received the product in collaboration with Evenflo and Latina Bloggers Connect to review with my son. The World Explorer ExerSaucer really is worth every penny and more! The 3-in 1 system is what makes this such a great buy. Unlike other saucers on the market, this one actually grows with your child. My daughter had an older model a couple of years ago and couldn't get enough of it. The Wold Explorer ExerSaucer is the latest version and is equipped with many new features, my favorite being the Language Pod. This little device is so amazing because it includes 12 scenes with 4 different languages. Your little one will love it, just as my nephew has. This post is sponsored and in collaboration with Evenflo and Latina Bloggers Connect. All opinions, as always, are my own. The World Explorer ExerSaucer really is worth every penny and more! The 3-in 1 system is what makes this such a great buy. Unlike others on the market, this one grows with the child. My daughter had an older model a couple of years ago and couldn't get enough of it. So when I had to decide what to get my nephew, it was a no brainer. The World Explorer ExerSaucer is the latest version which is equipped with many new features, my favorite being the Language Pod. This little device is so amazing because it includes 12 scenes in 4 languages. Your little one is going to love it, just like my nephew has. My niece was 3 months old when she started playing with this product, and we are happy to see that every day she learns new things with it. This toy is so complete that allows you to build different types of games depending on the age of the child. My niece loves to look in the mirror and listen to the different sounds. She tries to reach every part of it, and it is very entertaining. because she is a baby, she takes everything to her mouth and that's no a problem because this toy is easy to wash to prevent disease. We are very excited that she will start using the next stage of the game that will serve to exercise and strengthen her legs. We love this toy so much that my husband wants to buy it our newborn nephew. I received the product in collaboration with Evenflo and Latina Bloggers Connect to review with my niece. We just build the Exersaucer for my 9 month old baby. She is on the second stage "Move and Bounce" (4-12 months). As soon as we placed her on the Stationary Activity Center she didn't stop bouncing, moving around, and playing with all the toys. It has a self discovery mirror, a penguin, a panda and an elephant with sounds, and even a Pod with 12 scenes and 4 languages! we all love it! it is perfect for moms too since it allows you to do things in the house while your baby is entertained. I cant wait to see my baby enjoying the next stage! This review is part of a compensated campaign with LBC and Evenflo, all opinions are 100% my own. The ExerSaucer�‚® World Explorer Triple Fun�¢"�‚¢ Saucer from Evenflo is Amazing! I am a huge fan of grow with baby products, and this is one for my top favorites. This versatile toy can be used from infancy to toddlerhood. This one product will save you from buying three separate ones. The stage one playmat is soft, padded and can be easily cleaned. It can be used with the electronic toybar that has two pull toys. The toys light up and make sounds to engage baby. The stage two activity center has three height positions, a washable seat cover and a built in carry handle. The Exersaucer folds down flat for easy storage or for traveling. Then once baby is walking on their own is it time for stage three, the activity table. They can walking around the fun "S" shape table to play with all the fun toys. The ExerSaucer�‚® World Explorer Triple Funâ�"¢ Saucer from Evenflo is Amazing! I am a huge fan of grow with baby products, and this is one for my top favorites. This versatile toy can be used from infancy to toddlerhood. This one product will save you from buying three separate ones. The stage one playmat is soft, padded and can be easily cleaned. It can be used with the electronic toybar that has two pull toys. The toys light up and make sounds to engage baby. The stage two activity center has three height positions, a washable seat cover and a built in carry handle. The Exersaucer folds down flat for easy storage or for traveling. Then once baby is walking on their own is it time for stage three, the activity table. They can walking around the fun "S" shape table to play with all the fun toys. Amazing | Both Toddlers LOVE this! I have two toddlers and they both have a ball with this. We set this up in Stage 3 since they are already 1 and 2 and it keeps them very entertained. They love the language pod and the rest of the interactive toys. It's a great value because it grows with your baby. The 3 stages of this product ensures that you don't need to spend 3x as much on different exersaucers to keep them entertained. I would definitely recommend this product to all new moms. I was compensated to write this review for a campaign in collaboration with Evenflo and Latina Bloggers Connect This is a great baby purchase because it grows with your baby. We used the activity table as my son is now 20 months and he loves it. He has been playing with it everyday. I gave it four starts because it was a bit hard and confusing to assemble and the legs are not as sturdy as I would like for my strong little man but it's a great little table for toddlers. My baby boy is 5 months old. He loves playing here. I like the product has a lot of fun. this toy can be at home for two years. I do not have to buy more toys. It is perfect for Christmas. This was given to a 9 month old who hates being confined so we immediately set it up to stage 3 since she was starting to learn how to walk. We loved the hands on toy activities that she could play with and the toy book was a hit with her. She especially loved the mirror which she fell in love with instantly. Set up was super easy and the only thing that we had to get was the batteries which are not included. I love how this has 3 stages to grow with your little one and would recommend this as a baby shower gift to last through the years. This is a great value for your money. Baby interaction and learning at it's max! Got this a couple of days ago. Honestly I was extremely amazed of how many awesome toys this comes with, there ares so many features that keep my 8 month old completely entertained it's amazing, she keeps on pressing buttons and dances as the music goes on as wells as becoming talkative when the learning mode is on. She can stare at the blinking lights for a long period of time smiling and loving it. Thanks Evenflo this is one of the best products you have come up with we love it! I received a sample to review. All opinions are my own. I really like that this ExerSaucer grows with my baby and will be a staple toy for a while! My baby is almost 3 months old and he enjoys having tummy time on the foam mat. I cannot wait for him to start using Stage 2! We set this up for our 7 month old yesterday and he LOVES it! First, I let him play with it as a play mat to encourage crawling and he was reaching for the toys and amazed by the lights and music. Then, we put it together as an exersaucer and the fun never ends! We can't wait to use it in the 3rd mode when our son walks! I must say we had a little confusion when putting it together as an exersaucer so it took a little longer to put together than I thought (an extra 15 minutes or so), but overall we have loved this toy! I would recommend as a Christmas gift to a new baby :) I was compensated to write this review for a campaign in collaboration with Evenflo and Latina Bloggers Connect. I just assembled our new Exersaucer and I am highly impressed with all the removeable parts and learning tools! I love the different stages because I will be able to use this product for a long time. When you think of the use you will get out of it, it really does make this item a huge bargain! Incredible Savings for Parents, 3 in One FUN! I received a sample to facilitate my review. Evenflo has come up with an incredible solution for new parents who are looking for various stages of play from newborn too toddler with their brand new Evenflo World Explorer Triple Fun Plus ExerSaucer. 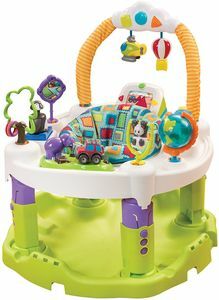 Our baby has had a blast the past few weeks with the Exersaucer and Activity Table portions of this incredible product. So many activities from pulling, spinning, pushing, and sounds galore. She is entertained, laughing and enjoying every second of the Evenflo World Explorer Triple Fun Plus ExerSaucer. It starts off as a Playmat, than as baby grows you can turn it into an exersaucer and than finally a super cool S shaped activity table once baby is standing. Its a ton of fun and i am so impressed! I highly recommend it! As a mom of 5, I am very pleased to say that this ExerSaucer can be used for many years. My 6 weeks old loves the playmat, and my 2 and 3 year old loves playing with it as an activity center. There is a lot of features that busy moms can appreciate and kids can enjoy. Definitely a great buy. We did receive the product for review. All opinions are 100% our own. Love that it's 3 great things in 1! My little girl is 5 months old. We didn't get it soon enough to utilize the floor mat very much, but she is LOVING the ExerSaucer. I'm able to get so much done around my house now while she's happily playing. I love that once she outgrows that, I'll be able to convert it to a toy she can keep playing with. My child and I love the ExerSaucer! He plays, learns, moves and is busy at the same time mommy is doing her chores, reassured that he is in a safe place. Also, I love the features and the different languages! It is really important to me that my child learns Spanish (my native language) and English (My spouses language). This is a wonderful product for babies. It's educational and so helpful that it grows along with the child. The baby can use it from infancy until they are a toddler. This makes it well worth the money. My son is 2 months and loves it. It's also easy to clean and store! Even if it wasn't on sale at BRU right now (only$103.99!! ), it is worth every penny! Babies outgrow items so quickly and I love how this toy grows with your child from birth to 24 months. There's so many toys and activities on this exersaucer, your child will never be bored. I've recommended this to all my pregnant friends for their registries! Grows with Baby - Made to Last! I received a sample to facilitate my review. This product is absolutely worth the investment. It is made to last, provides hours of entertainment for anyone around, and makes learning fun. I love how durable the toy is. Although my baby is only 3 months old right now, I'm not worried about this toy surviving until he's 3. And that's *with* my 22 month old also using it. It was definitely built to last. There are only a few things I wish I had known beforehand: 1. Assembly is not quick. It took me over an hour to put it together. I wish it had been more assembled in the box, but this would not keep me from purchasing the ExerSaucer. 2. It uses a LOT of batteries. (3 AA and 7 AAA) We've used the product daily for several weeks now, and the batteries have not needed replaced yet, so that's a good thing! 3. Going from Stage 2 to Stage 3 was confusing for me. My husband was able to figure it out rather quickly, but I didn't like needing to wait for his help. Even though there are drawbacks, once this ExerSaucer is assembled, it is absolutely worth every penny. I would highly recommend this product to anyone with a new baby, a toddler, or both! There are many activities to entertain my busy baby. Amazing Product, great value for money! I received a sample to facilitate my review. I love that this product grows with your little one. Can be used from birth thru 2 years (or more, my 3 year old niece loves it too). The play mat is great for little ones. It's padded to be able to keep our smallest little ones safe and helps encourage tummy time. The stationary activity center is fantastic. Little ones jump and bounce around, interacting with the wide variety of items they are able to play and interact with. The activity table keeps my 17 month olds attention, she goes from one activity to the next and back again. My family highly recommends this exersaucer to your family, your little ones will love it. I love the 3 in 1 design. Easy to change from. Playmar, to exersaucer to play table. Easy for child to move in complete circle around toys. Definitely would recommend this. Love how it grows with your child! I have been so impressed with this exersaucer. My daughter is now 20 months old and is playing with its last stage and it always seems to keep her entertained. I have been using this for my almost 5 month old for about 3 weeks now and I love it. It gives him so much freedom to play and learn and allows me to put him down and cross a few things off my "to do" list. I look forward to many many months of use. My seven month old loves his ExerSaucer. I wish I had purchased it when he was younger. It is really 3 in one...and grows with the child. The colors are exciting and he loves that he is able to spin around and get to different things that he is interested in. I would recommend this! i love . I love that my baby a single investment could play for a while and learn. This is such a cute exercise gym! My 2-month old loves it! She giggles and makes happy noises when she hits the globe. And when I pull the balloon she gazes at the lights and listens closely to the song. I can't wait for her to grow older and to use the other stations. This is a very interactive gym and involves on many levels - love it! I like how it transitions through the ages. Very visual! This is the best exersaucer because it replaces 3 baby products in one. As an infant it's a playmat, then an exersaucer with a ton of entertainment for babies and finally a long play table. The play table is great for cruising toddlers learning to walk. We are very happy with our purchase and recommend this to anyone looking for an exersaucer. The ability to grow with child is a huge plus. They can use it longer especially if you have kids close in age. The seat spins easily. Baby enjoyed all the buttons, lights and sounds. Easy for her to use each feature of the saucer. Easily adjustable. The product was new and exciting. My baby would love to play all day. My child really appreciated the different activities. Very nice variety. My child walked right up and started playing because it was so attractive to him. I got this product a few weeks ago and beyond satisfied with it. We are so excited that we get to use it for our little one. I love that it's a 3 in 1. My husband and I are bilingual and really enjoy the fact that Evenflo came out with a product that will help us in teaching our child Spanish. Great product, easy to assemble, love that it converts into 3 different things! I think she would be entertained in it. I like that the toys come out. Product functions well, interactive and fun to use. Looks easy to clean and parts are durable. Like that it is multi functional and can transform to serve other purpose. We have experience with several activity saucers but this one is by far the best! My 5 month old son played in it for over an hour straight last night. The bright colors and creative toys keep him entertained. Not only is he entertained but also learning with the sounds, languages and variety of play toys. I'm excited the toy "grows" with him as I think this is going to be a favorite! My son loves this ExerSaucer! All of the toys are great. He also loves being able to spin around in it so easily. He loves bouncing and he definitely does a lot of bouncing when he plays in this. It's also very light and easy to move to different parts of the house. I love having it in the kitchen while I cook. I really like the languages as well. This ExerSaucer is so versatile. You will not need to buy another playmat for your infant or play table for your toddler! This has all 3 in 1. All of the toy attachments are very interactive, colorful and educational. My 4 year old loves to show his little brother how to play with them. Easy to collapse and store when not in use. I got the exer-saucer a couple weeks ago and absolutely love it. I love that you have 3 options for use. My baby is only 3 weeks old so he is using stage 1 as an activity gym, however I have it put together for the exer-saucer state as well which I can't wait to use. The Evenflo World Explorer Exersauce has been an amazing addition to our entertainment and learning alternatives at home! I love that 4 languages are included, so cool! Also, the "grow with you" 3-in1 feature is ideal so our little baby girl can enjoy it wen longer! I love this exersaucer! It has lots of activities for my daughter to play with, fun and interactive sounds and teaches her different languages! Plus you can use it as a play table or play mat as well! It is easy to break down and store when not in use too! I'm very thankful to have this! Our older girls love it too! Love that it grows with baby. I really like the mat that is comfortable and easy to wipe off. The screen pod was a little hard to use for a baby, buttons weren't easy to push. I love that this exersaucer has so many great toys and has 4 languages! The play mat is very soft and has an adorable pattern! The innovation behind this product is very unique. This is a great product with lots of value for baby. Great features - endless fun!! My child loved the toys included, especially the glove. The pod was a little challenging to change from picture to picture. My child loved the new sounds. I love that I would be able to use it as she stands on her own. Like the lifespan of the triple fun system and the thicker foam pad. Also a fan of the multiple languages. Love the different stages and all the options on the table top. Lots of features for a busy baby! My son loved the World Explorer. He interacted with all the toys immediately. It is a very engaging and interacting toy. The features looked nice. I love that it can grow with them! This is a great toy from 3 month olds clear up to 2 year olds. The toys on the exer saucer are new and improved and very fun! My baby just loves it!! Very pleased with this product. This product has so much to offer my baby through every stage. I love that it bounces, can rock, or can be stable. My baby can reach the toys at 4 months, which she can't in our bouncer. The tummy time mat is comfy material. The colors are fun! I really liked the different stages of the saucer. It can be used as my son grows. Really liked all the play options on the Exersaucer and the different stage options as well. Great toy as baby grows. Awesome that it bounces as well which is a great added feature. I am very excited that the exersaucer grows with the child. It is so nice that you can use it beyond the infant years!